After President Barack Obama called for gay rights in Nairobi on Saturday, Kenyan President Uhuru Kenyatta corrected his counterpart, saying homosexuality is a "non-issue" in Kenya and those rights cannot be "imposed" on the people of the East African country. "For Kenyans today, the issue of gay rights is really a non-issue," President Kenyatta said at a joint-press conference with President Obama at the State House in Nairobi on Saturday, according to Daily Nation. 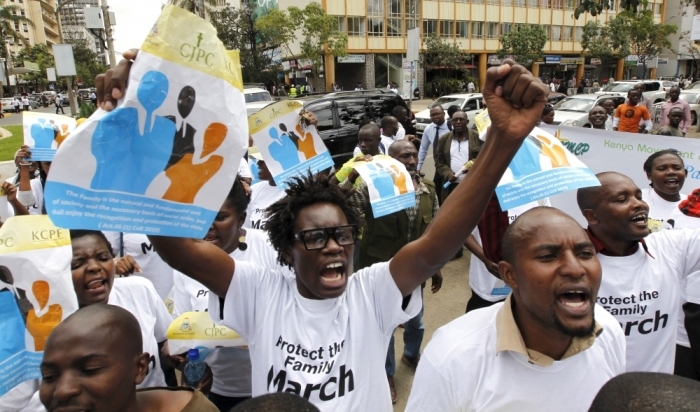 In Kenyan law, homosexual acts are illegal and carry punishments of up to 14 years in prison. Obama, whose father was Kenyan, said at the conference, "I have been consistent all across Africa on this. I believe in the principle of treating people equally under the law and that they are deserving of equal protection under the law and that the State should not discriminate against the people based on their sexual orientation." Kenyatta agreed that "Kenya and the United States share so many values; our common love for democracy, entrepreneurship and value for families." But he went on to say, "There are other things that we do not share; our cultures, our societies do not accept. It is very difficult to impose on people that which they themselves do not accept. This is why I repeatedly say that for Kenyans today, the issue of gay rights is really a non-issue." The Kenyan president added, "We want to focus on other areas that are day-to-day living for our people – the health issues that we have discussed with President Obama are critical. Issues of ensuring inclusivity of women; a huge section of society that is normally left out of the mainstream of economic development." The key focuses include "what we can do in terms of infrastructure, education, giving them power and encouraging entrepreneurship," Kenyatta said. "Once we have overcome some of these challenges, we can begin to look at new ones. As of now, the fact remains that this issue is not really an issue that is on the foremost minds of Kenyans and that is a fact." Standing next to Kenyatta, Obama at the press conference urged Kenyans to recognize "that there may be people who have different religious or cultural beliefs but the issue is, how does the State operate relative to people?" The history of countries around the world suggests, Obama added, "when you start treating people differently not because of the harm that they are doing to anybody but because they are different, that is the path whereby freedoms begin to erode and bad things happen." Obama further said: "As an African American in the United States, I am painfully aware of the history of what happens when people are treated differently under the law. There were all sorts of rationalizations that were provided by the power structure for decades in the United States for segregation and they were wrong. "I am unequivocal on this; if somebody is a law abiding citizen who is going about their business, going to their job and obeying the traffic signs and doing the other things that good citizens are supposed to do and not harming anybody, the idea that they are going to be treated differently or abused because of who they love is wrong."